Large amounts of methane are erupting from the seafloor of the Arctic Ocean. These methane eruptions are often missed by measuring stations, because these stations are located on land, while measurements are typically taken at low altitude, thus missing the methane that rises in plumes from the Arctic Ocean. By the time the methane reaches the coast, it has typically risen to higher altitudes, thus not showing up in low-altitude measurements taken at stations on land. 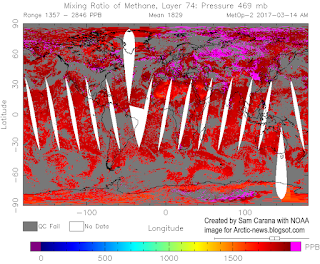 The image below shows the highest mean global methane levels on March 10 over the years from 2013 through 2017, for selected altitudes corresponding to 945 mb (close to sea level) to 74 mb. 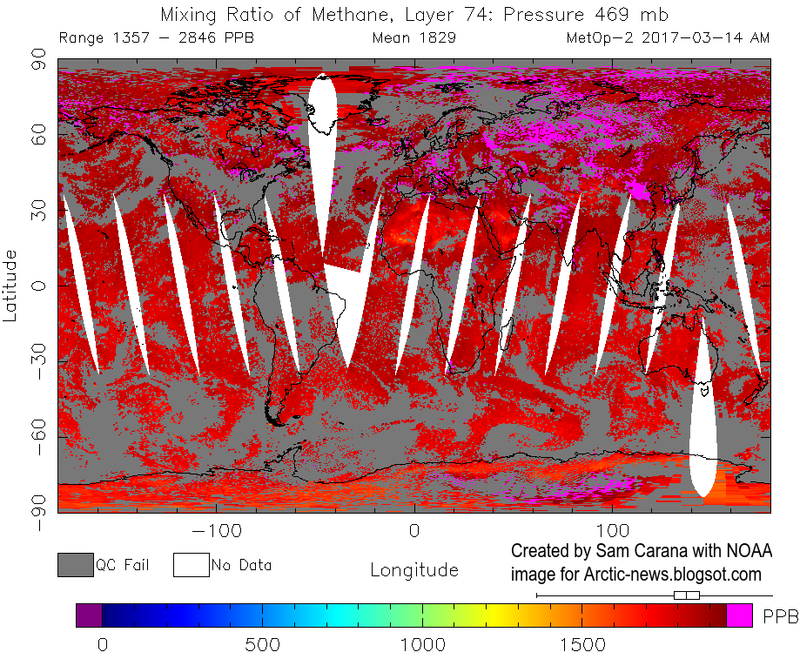 Above image shows that, over the years, methane levels have risen strongly high in the Troposphere, up into the Stratosphere. This looks like the signature of methane that originated from the seafloor of the Arctic Ocean. The image below further explains why. The Tropopause separates the Troposphere from the Stratosphere. The Troposphere ends at a height of some 9 km (5.6 mi; 30,000 ft) at the poles, and at a height of some 17 km (11 mi; 56,000 ft) at the Equator. Methane over the Arctic typically does show up on satellite images at altitudes between 4.4 km and 6 km (14,400 ft and 19,800 ft). Seafloor methane will show up better at these higher altitudes where it spreads out over larger areas. At even higher altitudes, methane will then follow the Tropopause, i.e. the methane will rise in altitude while moving closer to the equator. In conclusion, methane originating from the seafloor of the Arctic Ocean can strongly contribute to high methane levels that show up over the Equator at higher altitudes, but this methane can be misinterpreted for methane originating from tropical wetlands. 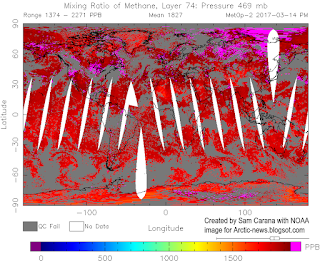 On March 14, 2017, methane levels were as high as 2846 ppb, as illustrated by the image on the right. 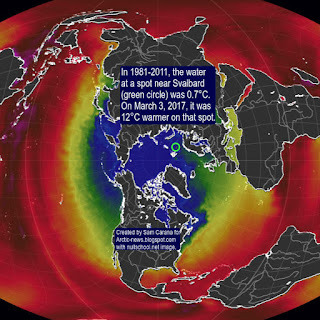 While the origin of these high levels looks hard to determine from this image, the high levels showing up over the East Siberian Arctic Shelf (ESAS) later that day (image underneath) give an ominous warning that destabilization of methane hydrates is taking place. 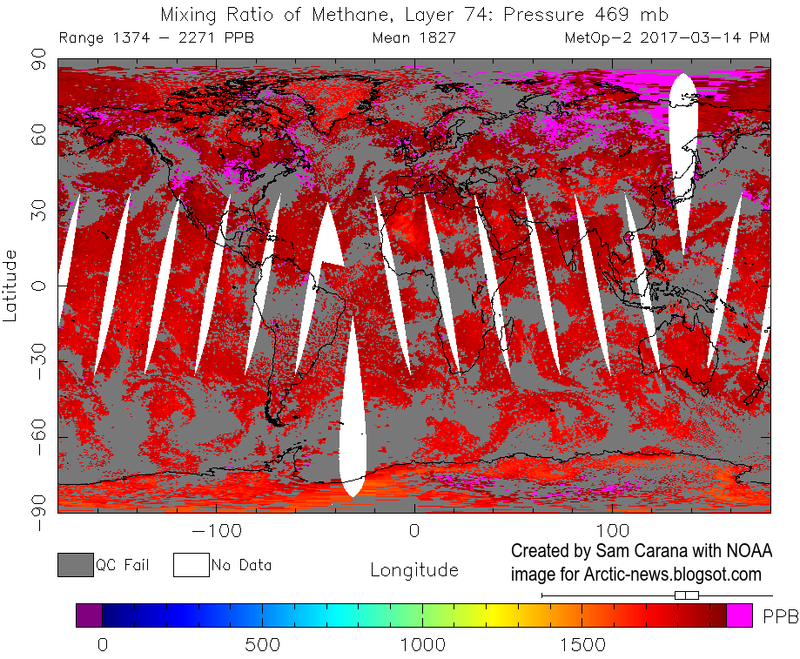 The images also show that high methane levels are showing up at many other places, e.g. over Antarctica where hydrate destabilization also appears to be taking place, which could also be the cause of noctilucent clouds as discussed in earlier posts (see links at end of this post). Why is methane erupting from the Arctic Ocean? 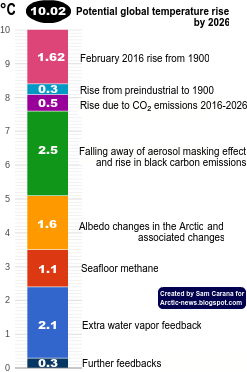 Why are increasingly large quantities of methane erupting from the seafloor of the Arctic Ocean? 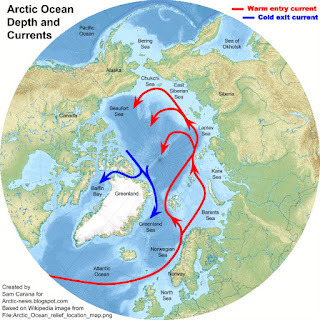 The main driver is warming of the Arctic Ocean that is destabilizing once-permanently-frozen sediments that contain huge amounts of methane in the form of hydrates and free gas. Ocean heat is increasingly entering the Arctic Ocean from the Atlantic Ocean, as illustrated by the images below. Self-reinforcing feedbacks, in particular sea ice decline, further speed up warming of the Arctic Ocean. 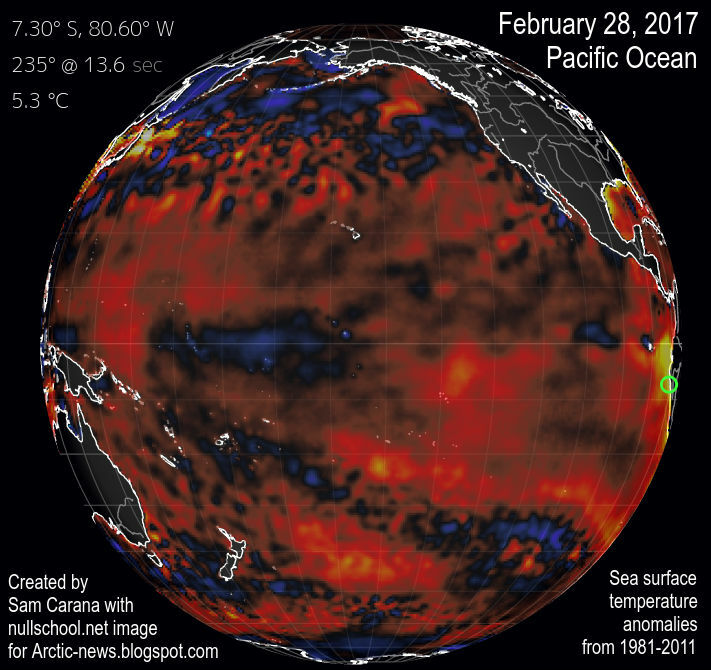 Meanwhile, the next El Niño event has already started, at a time when sea surface temperature anomalies over the Pacific Ocean are very high as illustrated by the image on the right showing sea surface temperature anomalies east of South America as high as 5.3°C or 9.5°F (compared to 1981-2011) on February 28, 2017. 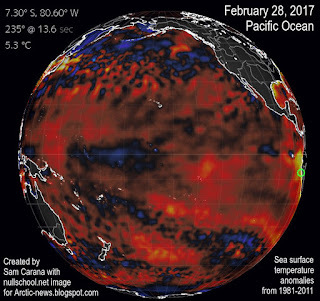 Greater contrast between sea surface temperatures and temperatures on land has contributed to flooding in California and South America. Importantly, more water vapor in the atmosphere results in more warming, since water vapor is a potent greenhouse gas. In other words, temperatures in 2017 look set to be very high, which spells bad news for the Arctic where temperature anomalies are already several times higher than in the rest of the world. 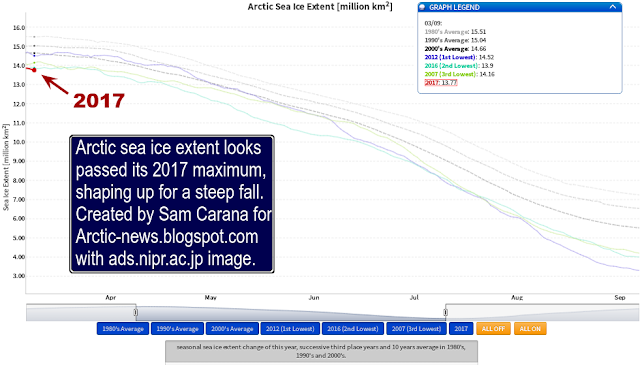 Arctic sea ice looks set to take a steep fall, as illustrated by the image below. 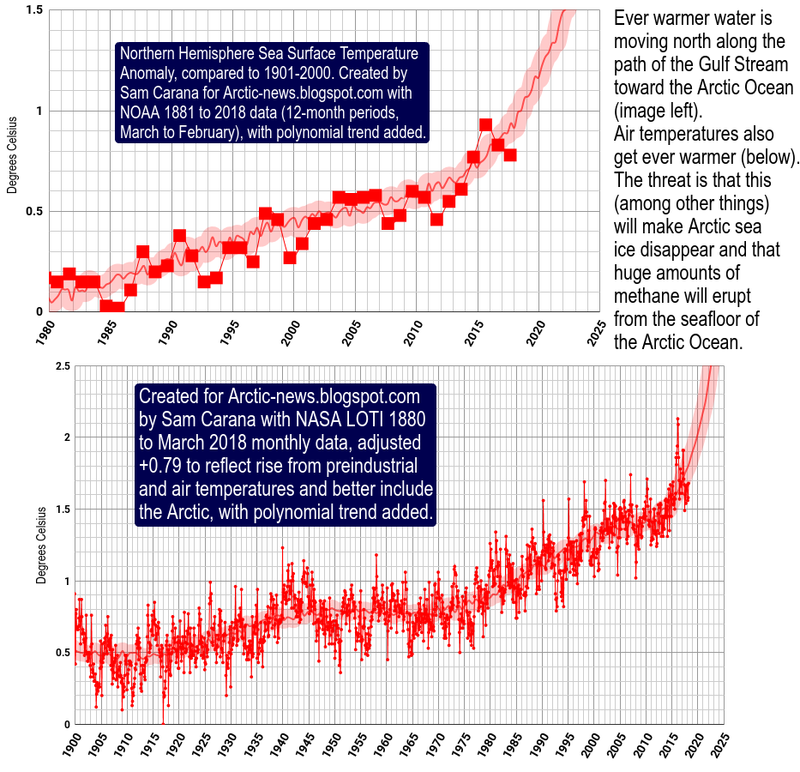 The danger is that further self-reinforcing feedback loops such as albedo decline and methane releases will accelerate warming and, in combination with further warming elements, cause a temperature rise as high as 10°C or 18°F by the year 2026, as described at the extinction page.